Oh man, today was a productive day! Still, like every town day or zero, I wish I had done more, but I’m very happy with everything I was able to do. I proudly stayed in my room 99% of the day and just left to go to the main office or another hiker’s room twice. 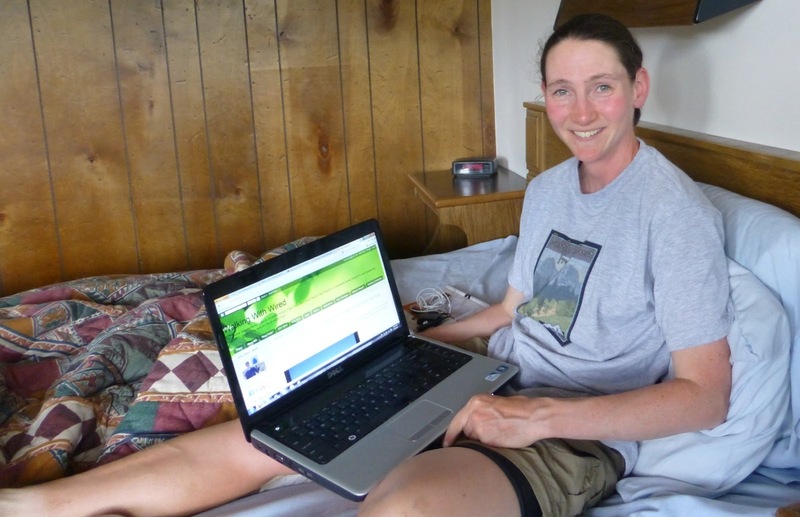 Most of the day was spent with my feet up in the bed using my laptop. Heavenly! I did my dreaded resupply for this next leg and got lots of great gifts from friends, family, and readers. My sister and brother-in-law sent a Mountain House and an old cd we had of one of my favorite movies that I’ve mentioned before called Searching for Bobby Fischer that I was able to load onto my MP3 player. My aunt and uncle Edie and George sent more Reeses and a Mountain House. 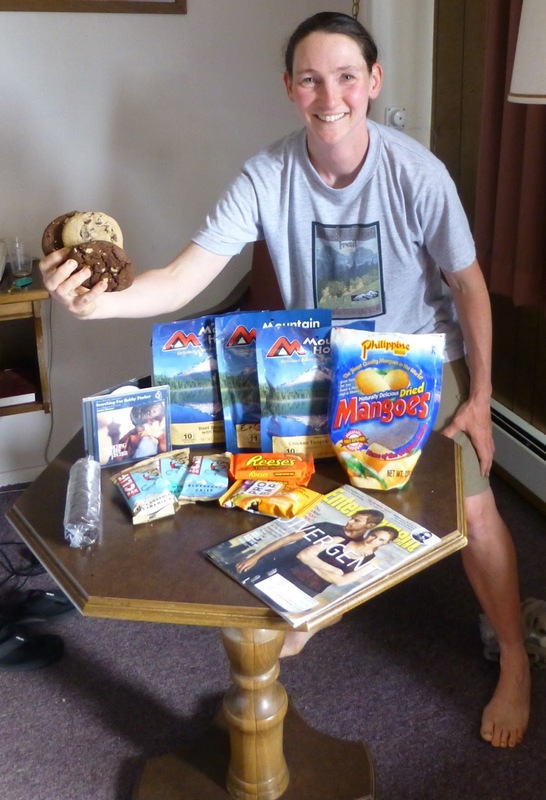 Blog followers Jim and Olivia sent me a ton of Oreos and dried mangoes that I was also able to share with other hikers. My ration of Cliff Bars from Corrina. My friends Mark & Merav sent me a Mountain House and a ProBar. I really am so fortunate to have such support! I also got my Entertainment Weekly magazine which is perfect for a zero. The other perfect thing for a zero and a full nero was the dozen Mrs Fields cookies that my aunt Linda sent me. They were AWESOME! I shared a few with other hikers, but most were devoured by me. Yum! THANK YOU all for such gifts! I also want to add that I was gifted some audiobooks that I can’t wait to listen to on those Wyoming road walks. I got the Solitude of Prime Numbers from Kai and Dirty Girl (www.dirtygirlgaiters.com) got me an Audible subscription and with my first two books I chose And The Mountains Echoed and Perks of Being a Wildflower. I am fortunate that so many people are supporting me with my resupplies. I still have my Care Package tab with my list of what I need, but I am getting close to maxing out. As I fill my quota for dinners, bars, etc, I will cross them off the list, so double check before sending anything. At this point, it’s the hotel stays and town food that would be most helpful, so monetary support is also welcome and my dad can deposit them for me at the same address as the care packages. I have worked hard to afford this trip, so I am totally fine. I mention it because I know many of you want to give thanks through care packages and I want to make sure it goes directly to my trail needs. I’d be bummed to come home to a pile of Mountain Houses and Cliff Bars that I didn’t get to use. 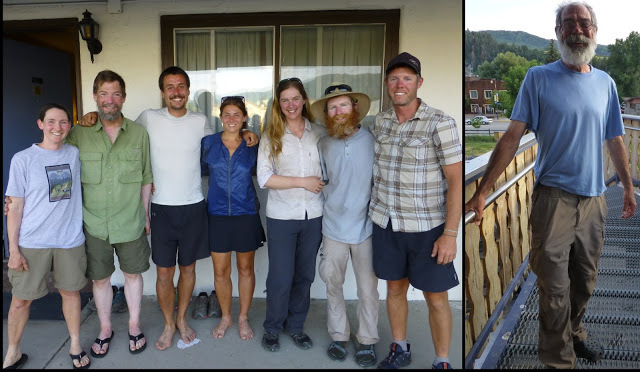 I also want to give a plug for the Continental Divide Trail Coalition which was just formed in the last year or so to protect and preserve the CDT. The trail is still only 71% complete and the CDTC has made amazing strides in the short amount of time that it has been functioning. I have been on trail and just found out about their campaign to raise $35,000 by the end of the day tomorrow (July 5th). Right now, they are $5,000 from their goal and I just donated. If you would like to donate, then click here to help them reach their goal! Back to today, the first half of the day, I had all to myself and I was able to make phone calls, Skype, and get all my pictures and videos loaded onto the blog. As the day continued, more hikers arrived. There were some distractions, but in a good way and it was good to see so many hikers. I didn’t think there were so many between me and my crew! They are all zeroing or leaving later tomorrow, so I will be setting off on my own tomorrow. I’m actually looking forward to it. I enjoy everyone, but definitely feel anxious with so many people around. I still need some calm and quiet for at least another leg to feel more relaxed. Once I start to feel bored or lonely, I’ll be sure to wait for the group a bit. They are expected to be in town by noon tomorrow, but I don’t know if they will zero as most everyone is after the draining stretch over the Grays/Torreys route. It’s good to know everyone is so close too! Some are pretty speedy so they will probably catch up soon. me, Sycamore, Bloodbath, Rampage, Castle, Portrait, Estero, and Papa Smurf who came after our group pic! done so I can watch HULU! I’m going to finish the last few episodes of the Mindy Project and Modern Family. So excited! I still need to finish Community and haven’t even started Real World: Portland yet. Always good to have something on the Queue! Anyone that knows how I can get SYTYCD on my iPhone, be sure to email me and let me know! I’m bummed to be missing that one! There are also fireworks that will be going off right outside my door on the big hill across the street. I can see them from my balcony door and window! A great zero!